Launched in 2008, Red Flush Casino was awarded the CasinoMeister Best New Casino Award the same year. The online casino continued to win awards and remain one of the top online casinos in the industry. Since it is powered by Microgaming, it offers a portfolio of over 600 games. Licensed and regulated in Malta, Red Flush gives top priority to customer satisfaction, fair gambling, and responsible gaming. The Red Flush portfolio contains over 600 games featuring world-class HD graphics and sound effects, with new games being introduced regularly. Players can choose from video poker games, online slots, and table games. Since Red Flush is home to Microgaming’s lucrative progressive jackpot network, it offers progressive slots and table games such as The Dark Knight, Major Millions, Tunzamunni, King Cashalot, Cash Splash, Mega Moolah, Roulette Royale, Cyberstud, and Poker Ride, to mention a few. Players can either download the casino or play directly from their browsers. New players can grab up to $1000 in free casino bonuses at Red Flush Casino. The online casino offers a first deposit bonus of 100% up to $200, a second deposit bonus of 50% up to $100, and a third deposit bonus of 25% up to $400. In addition, players will be automatically entered into the online casino’s loyalty program and 500 loyalty points will be credited to their accounts. Players can also claim a $50 bonus every month for the next six months. Instead of claiming the above-mentioned first deposit bonus of 100% up to $200, new players can also opt to receive a 100% cash match bonus of up to $150 on their first deposits and 50 free games on Thunderstruck II slot. They will also be eligible to receive the second deposit bonus of 50% up to $100, the third deposit bonus of 25% up to $400, 500 loyalty points, and entry into the loyalty program. In addition, they will receive entries to a slots freeroll and 100 free games every month for three months. Red Flush Casino runs lucrative promotions on all week days, which means that players can always grab extra bonuses, cash back offers, free spins on new games, and loyalty points. The online casino keeps players informed about its latest promotions through text messages, Twitter, Facebook, and emails. There is also an attractive loyalty program, which rewards real money players in a grand way. Funds can be deposited safely and securely through Visa, MasterCard, EntroPay, Maestro, Postepay, PaySafeCard, UKash, Skrill, Neteller, Instadebit, Click2Pay, ClickandBuy, CitadelDirect, UseMyBank, and other methods. Since Red Flush uses 128-bit SSL encryption technology, banking is 100% safe and secure. Winnings can be withdrawn through Visa, Visa Electron, Skrill, Neteller, Click2Pay, Instadebit, ECOcard, UKash, online bank transfer, and courier. Red Flush Casino is an online casino gaming site I would strongly recommend to anybody who wants to play casino games online for real money. Since Red Flush Casino is powered by Microgaming, you can grab the benefits of over 600 games, including the world’s largest network of online progressive games. As soon as you sign up, you can grab a warm welcome bonus package of $1000, along with 500 loyalty points, access to Red Flush’s loyalty program, and a monthly bonus of $50 for six months. Right now, Red Flush Casino is giving away 10 free spins as a no-deposit bonus. Once you sign up, you can also claim 20 more free spins on your favorite Terminator 2 slot. Red Flush Casino has been successful right from the time it was launched in 2008. Winner of several industry awards, Red Flush provides a safe, fair, and entertaining gambling environment for anybody who cares to sign up. Download the casino software OR select the play online option then You must register a Real Money account. 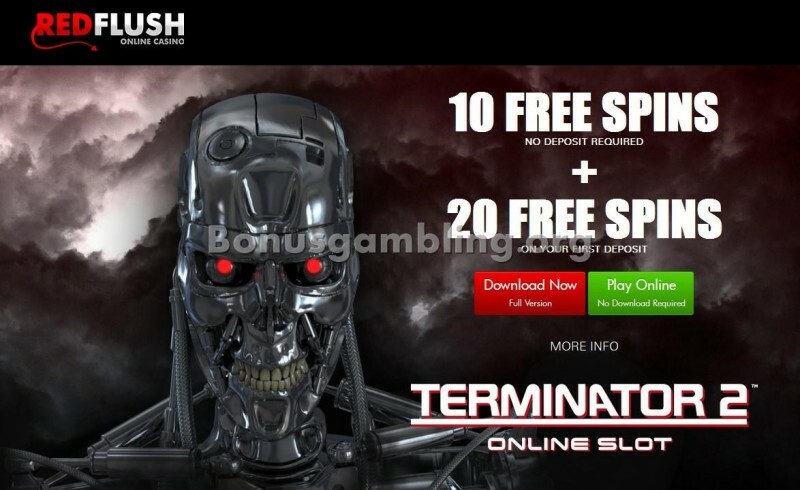 10 Free Spins will be credited to your account when you play the TERMINATOR 2™ online slot. Make your first deposit and Your 20 Free Spins will be credited to your casino account.